Novel PET radiotracers have potential in the early diagnosis and staging of PCa, detection of recurrence, and monitoring of metastases. Improvements in cancer care have been closely linked to advances in imaging technologies, as these have allowed for more accurate diagnosis, staging, and surveillance of the disease. Prostate cancer (PCa) has been unique in its reliance on a serum biomarker, prostate-specific antigen (PSA), as the major player for disease diagnosis, treatment, and surveillance. Until recently, the use of imaging in PCa was limited to transrectal ultrasonography (TRUS) for guidance of prostate biopsies and computed tomography (CT) and 99Tc bone scans for staging of the disease. Over the last 10 years, advances in magnetic resonance imaging (MRI) technology1,2 and the development of novel nuclear medicine radiotracers3 have revolutionized PCa management. In this review we will focus on the emerging role of positron emission tomography/computed tomography (PET/CT) for the diagnosis and management of PCa. PET/CT is a nuclear medicine technique that merges sequential images obtained from CT with PET into a single super-imposed image depicting the anatomical distribution of the injected radiotracer. The most widely used PET radiotracer is 18F-fluorodeoxyglucose (18F-FDG), a glucose analog, which collects in highly metabolic tissues, such as cancerous cells, as a result of the Warburg effect.4 While 18F-FDG-PET/CT has been used in a wide range of malignancies,5 the use of 18F-FDG-PET for PCa has been limited by poor radiotracer uptake,6,7 lack of discrimination between neoplastic and benign conditions,8,9 and high concentrations of radiotracer in the urine.7 Multiple new radiotracers have been developed and tested in the setting of PCa diagnosis and staging, identification post-treatment recurrence, and measurement of treatment response in metastatic disease (Table 1). PCa diagnosis and treatment presents a significant quandary to the treating physician given the biologic heterogeneity of the disease in addition to the substantial number of clinically insignificant cases diagnosed via PSA testing. Numerous serum10 and urine11 biomarkers have been introduced to help select patients who may harbor clinically significant disease. The introduction of multi-parametric MRI (mpMRI) for the diagnosis of clinically significant disease in patients presenting with an elevated PSA2 or those with persistent elevation in the setting of a negative biopsy1 has been the most significant advancement in the diagnosis of PCa since the introduction of the PSA test. With mpMRI, physicians not only can assess the risk of the disease,12 but also its location. A significant limitation of mpMRI remains the need for histologic confirmation via prostate biopsy, which still places the patient at risk for biopsy-related complications. To biologically characterize lesions identified in mpMRI, several groups have studied the added value of PET radiotracers in the diagnosis of clinically significant PCa. Radiotracers based on choline (11C-choline, 18F-choline) and acetate (11C-acetate, 18F-acetate) have been studied extensively in this setting, but their performance for primary detection13 has been wanting. These radiotracers perform significantly better with regard to disease staging,13,14 with excellent specificity (89%–99%) for detecting nodal involvement. With regard to staging, 68Ga-PSMA has been reported to clearly improve detection of lymph node metastases compared with conventional morphologic imaging (MRI or CT).20 In a pooled meta-analysis21 assessing 223 patients, the sensitivity and specificity for detecting lymph node metastases by 68Ga-PSMA was 61% and 97%, respectively. The introduction of these imaging techniques into clinical practice will likely cause a stage migration towards advanced disease, with a significant number of patients previously thought to have localized PCa being diagnosed with low-volume nodal or distant oligo-metastatic disease. The treatment of these patients remains controversial,22,23 with some small retrospective series advocating aggressive local management whereas others support systemic treatment. There are several ongoing trials (NCT02971358 and NCT03298087) assessing the best treatment plan for this patient cohort. While active surveillance has become the preferred treatment choice for patients with low-risk PCa, those presenting with intermediate- or high-risk disease should be offered aggressive local treatment with either surgery or radiation therapy. While these therapies result in a cure for a significant number of patients, approximately 15%–40% of these patients will experience biochemical recurrence (BCR).24 The management of recurrences can be tricky because they are hard to characterize with conventional imaging, and this usually leads to some form of overtreatment. A clear example is the radical prostatectomy patient with positive margins who experiences BCR 2 years after surgery. This patient eventually will be treated with salvage radiation therapy, with the hope that the recurrence is local; however, a significant number of these patients25 will not respond to salvage radiation, exposing them to potentially harmful adverse effects without an oncologic benefit. The increased sensitivity seen with novel PET radiotracers has the potential to allow for improved treatment allocation, thus maximizing oncologic benefit while reducing adverse effects. Figure 1: F-Fluciclovine PET/CT Imaging demonstrating a local recurrence following treatment with external beam radiation (PSA 4.86 ng/mL). A-B: Maximum intensity projection (MIP) image showing expected update by salivary glands, parathyroid, liver, and pancreas. 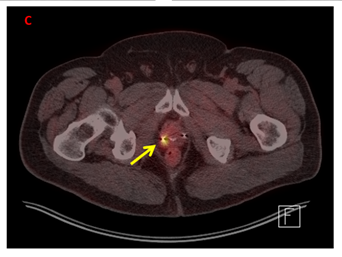 Yellow arrow points to prostatic recurrence. C: Axial PET/CT showing increase update in the right aspect of the prostate which was confirmed Gleason 4+5 prostate cancer. 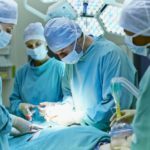 Patient underwent salvage cryotherapy of the prostate. PSMA-directed compounds have been increasingly studied and validated in the recurrence setting. In a meta-analysis by von Eyben et al,21 which pooled 983 patients, 68Ga-PSMA was found to have a sensitivity of 88% for recurrence detection at median PSA value of 2.3 ng/mL. In studies where the site of recurrence was reported, 10% were noted in the prostatic bed, 22% in the pelvic nodes, 13% at distant sites, and 36% had recurrences at multiple sites. Importantly, 68Ga-PSMA was noted to have 50% sensitivity and 97% specificity in identifying recurrences in patients presenting with PSA values ranging from 0.2 to 0.5 ng/mL. A recent study assessed the difference between 68Ga-PSMA and 18F-PSMA in patients with BCR showing that 18F-PSMA is slightly more sensitive than its European counterpart.28 This finding is important due the different process used for making each radiotracer. 68Ga-PSMA has a shorter half-life (68 vs 110 minutes) which requires the compound to be prepared in an on-site radiopharmacy. In contrast, 18F agents can be prepared in a central radiochemistry facility and then shipped to nearby imaging facilities for use. Figure 2. 18F-NaF-PET/CT of patient with elevated PSA (5.2 ng/mL) who presented with mild retroperitoneal adenopathy and a left ileac wing bone lesion concerning for metastatic prostate cancer. A-B: MIP image and axial SPECT/CT showing no 99mTc update by the bone lesion. C-F: 18F-NaF-PET/CT images showing 2 discrete areas of uptake in the posterior aspect of the left 2 rib and the previously identified left ileac wing bone lesion consistent with metastatic prostate cancer. Trials comparing fluciclovine and PSMA radiotracers are lacking, but a recent case report29 showed a comparable accuracy between both agents in detecting a pelvic recurrence in a post-prostatectomy patient with a PSA of 2.1 ng/mL. On analysis of the different PET parameters, 18F-PSMA was noted to have a higher maximum standardized uptake value (15.8 vs 5.9), whereas fluciclovine showed less background effect due to its slow excretion in the urine. As with staging, use of these novel PET agents will increase the diagnosis of low-volume recurrences, prompting the use of recurrence-directed local therapies (surgery and radiation). While multiple reports have shown that metastatic directed therapy is safe,30 the oncologic benefit of these interventions remains to be validated. Several ongoing clinical trials are trying to answer this question, including NCT02274779, which is assessing the role of radiation alone versus radiation plus hormonal therapy in patients with nodal recurrence, and NCT01558427, which is assessing the role of either surgery or radiation therapy for patients with low-volume metastatic disease. In large-volume or castrate-resistant metastatic PCa (CRPC), imaging findings more so than PSA response have been shown to be predictive of clinical outcome. Current imaging modalities for metastatic PCa consist of 99Tc bone scintigraphy and CT scans, both of which have been proven suboptimal for assessing treatment response.31 Although 18F-sodium fluoride (18F-NaF) has been available since 1972,32 its combined use with PET technology has been recent33 and has greatly improved the sensitivity for detecting bone metastases (Figure 2). In a prospective trial by Apolo et al,3 F18-NaF-PET/CT was shown not only to accurately detect bone metastases, but also to be useful in evaluating response and predicting outcome. It is important to note that F18-NaF-PET/CT measures the bone reaction to the tumor rather than the tumor itself. Thus, a positive scan may represent a delayed reaction to therapy rather than persistent tumor. Despite its low sensitivity for localized or early recurrent PCa, F18-FDG-PET/CT has shown some utility in metastatic PCa, and it seems to be highly prognostic in the late stages of the disease.34 In a small case series35 including 9 men with CRPC, 18F-FDG-PET/CT was found to be superior to 18F-NaF-PET/CT in predicting disease response and oncologic outcome. As a result, 18F-FDG-PET/CT has become an essential tool in clinical trials focusing on CRPC where PSA response or other imaging techniques may be of limited value. The role of PSMA-PET in the management of patients with large-volume or hormone refractory metastatic PCa remains to be defined. While the higher sensitivity of PSMA radiotracers may be appealing for assessing disease response, a possible confounding factor is the increased expression of the PSMA protein associated with antiandrogen therapy in PCa cell lines and animal models.36 A new and exciting application of the PSMA ligands is their linking with beta emitters (90Y and 177Lu), for targeted treatment of metastatic foci. In a phase 1 trial37 using 177Lu-PSMA in 56 patients with CRPC, the targeted therapy was found to have a low adverse effect profile, with 56% of the patients achieving a partial response. In summary, the aforementioned novel PET agents have shown great potential in the early diagnosis and staging of PCa, detection of post-treatment recurrence, and monitoring of metastases not previously possible with current imaging technologies. PSMA-based radiotracers appear to have an early advantage due to their increased sensitivity and specificity for PCa cells. PSMA, however, is not yet commercially available, whereas both 11C-choline and fluciclovine have FDA approval. The growing excitement about the translation of these novel PET agents into clinical practice must be tempered, as there is a lack of large validation trials in which tissue and survival end points are being measured. Increased diagnosis of low-volume metastatic disease in patients previously thought to have localized PCa. The oncologic benefit of local therapy or metastatic targeted therapy in this setting remains largely unknown, so all efforts should be made to manage these patients in clinical trials. With improvements in the manufacturing and distribution of these newer tracers, the use of PET-based imaging is likely to play a pivotal role in the future diagnosis and management of patients with PCa, paving the way for individualized treatment plans that maximize oncologic outcomes with reduction of treatment related adverse effects. Andres F. Correa, MD, (left) is a urologic oncology fellow and Marc C. Smaldone, MD, MSHP, is associate professor of urologic oncology at Fox Chase Cancer Center in Philadelphia, part of the Temple University Health System. Both physicians are in the Department of Surgical Oncology, Division of Urologic Oncology. 1. Siddiqui MM, Rais-Bahrami S, Turkbey B, et al. Comparison of MR/ultrasound fusion-guided biopsy with ultrasound-guided biopsy for the diagnosis of prostate cancer. JAMA. 2015;313:390-397. 2. Ahmed HU, El-Shater Bosaily A, Brown LC, et al. Diagnostic accuracy of multi-parametric MRI and TRUS biopsy in prostate cancer (PROMIS): a paired validating confirmatory study. Lancet. 2017;389(10071):815-822. 3. Apolo AB, Lindenberg L, Shih JH, et al. Prospective study evaluating Na18F PET/CT in predicting clinical outcomes and survival in advanced prostate cancer. J Nucl Med. 2016;57(6):886-892. 4. Vander Heiden MG, Cantley LC, Thompson CB. Understanding the Warburg effect: The metabolic requirements of cell proliferation. Science. 2009;324(5930):1029-1033. 5. Fletcher JW, Djulbegovic B, Soares HP, et al. Recommendations on the use of 18F-FDG PET in oncology. J Nucl Med. 2008;49(3):480-508. 6. Powles T, Murray I, Brock C, et al. Molecular positron emission tomography and PET/CT imaging in urological malignancies. Eur Urol. 2007;51:1511-1520. 7. von Mallek D, Backhaus B, Muller SC, et al. [Technical limits of PET/CT with 18FDG in prostate cancer]. Aktuelle Urol. 2006;37:218-221. 8. Bouchelouche K, Oehr P. Positron emission tomography and positron emission tomography/computerized tomography of urological malignancies: an update review. J Urol. 2008;179:34-45. 9. Jadvar H. Is there use for FDG-PET in prostate cancer? Semin Nucl Med. 2016;46:502-506. 10. Fradet Y. Biomarkers in prostate cancer diagnosis and prognosis: beyond prostate-specific antigen. Curr Opin Urol. 2009;19:243-246. 11. Wei JT. Urinary biomarkers for prostate cancer. Curr Opin Urol. 2015;25:77-82. 12. Zhang L, Tang M, Chen S, et al. A meta-analysis of use of Prostate Imaging Reporting and Data System Version 2 (PI-RADS V2) with multiparametric MR imaging for the detection of prostate cancer. Eur Radiol. 2017; published online ahead of print. 13. Schuster DM, Nanni C, Fanti S. PET tracers beyond FDG in prostate cancer. Semin Nucl Med. 2016;46:507-521. 14. Haseebuddin M, Dehdashti F, Siegel BA, et al. 11C-acetate PET/CT before radical prostatectomy: nodal staging and treatment failure prediction. J Nucl Med. 2013;54:699-706. 15. Afshar-Oromieh A, Haberkorn U, Eder M, et al. [68Ga]Gallium-labelled PSMA ligand as superior PET tracer for the diagnosis of prostate cancer: comparison with 18F-FECH. Eur J Nucl Med. 2012;39:1085-1086. 16. Bouchelouche K, Choyke PL, Capala J. Prostate specific membrane antigen- a target for imaging and therapy with radionuclides. Discov Med. 2010;9:55-61. 17. Eiber M, Weirich G, Holzapfel K, et al. Simultaneous 68Ga-PSMA HBED-CC PET/MRI improves the localization of primary prostate cancer. Eur Urol. 2016;70:829-836. 18. Rowe SP, Gage KL, Faraj SF, et al. (1)(8)F-DCFBC PET/CT for PSMA-based detection and characterization of primary prostate cancer. J Nucl Med. 2015;56:1003-1010. 19. Hoeks CM, Hambrock T, Yakar D, et al. Transition zone prostate cancer: detection and localization with 3-T multiparametric MR imaging. Radiology. 2013;266(1):207-217. 20. Maurer T, Gschwend JE, Rauscher I, et al. Diagnostic efficacy of (68)Gallium-PSMA positron emission tomography compared to conventional imaging for lymph node staging of 130 consecutive patients with intermediate to high risk prostate cancer. J Urol. 2016;195:1436-1443. 21. von Eyben FE, Picchio M, von Eyben R, et al. 68Ga-labeled prostate-specific membrane antigen ligand positron emission tomography/computed tomography for prostate cancer: A systematic review and meta-analysis. Eur Urol Focus. 2016; published online ahead of print. 22. Stevens DJ, Sooriakumaran P. Oligometastatic prostate cancer. Curr Treat Options Oncol. 2016;17:62. 23. Broughman JR, Chen RC. Management of node-positive and oligometastatic prostate cancer. Semin Radiat Oncol.27:79-86. 24. Punnen S, Cooperberg MR, D’Amico AV, et al. Management of biochemical recurrence after primary treatment of prostate cancer: A systematic review of the literature. Eur Urol. 2013;64(6):905-915. 25. Stephenson AJ, Scardino PT, Kattan MW, et al. Predicting the outcome of salvage radiation therapy for recurrent prostate cancer after radical prostatectomy. J Clin Oncol. 2007;25:2035-2041. 26. Odewole OA, Tade FI, Nieh PT, et al. Recurrent prostate cancer detection with anti-3-[(18)F]FACBC PET/CT: comparison with CT. Eur J Nucl Med Mol Imaging. 2016;43:1773-1783. 27. Nanni C, Zanoni L, Pultrone C, et al. (18)F-FACBC (anti1-amino-3-(18)F-fluorocyclobutane-1-carboxylic acid) versus (11)C-choline PET/CT in prostate cancer relapse: results of a prospective trial. Eur J Nucl Med Mol Imaging. 2016;43:1601-1610. 28. Dietlein M, Kobe C, Kuhnert G, et al. Comparison of [(18)F]DCFPyL and [ (68)Ga]Ga-PSMA-HBED-CC for PSMA-PET imaging in patients with relapsed prostate cancer. Mol Imaging Biol. 2015;17:575-584. 29. Gorin MA, Ball MW, Pierorazio PM, et al. Outcomes and predictors of clinical T1 to pathological T3a tumor up-staging after robotic partial nephrectomy: A multi-institutional analysis. J Urol. 2013;190:1907-1911. 30. Ost P, Bossi A, Decaestecker K, et al. Metastasis-directed therapy of regional and distant recurrences after curative treatment of prostate cancer: a systematic review of the literature. Eur Urol. 2015;67:852-863. 31. Tiguert R, Gheiler EL, Tefilli MV, et al. Lymph node size does not correlate with the presence of prostate cancer metastasis. Urology. 1999;53:367-371. 32. Harmer CL, Burns JE, Sams A, Spittle M. The value of fluorine-18 for scanning bone tumours. Clin Radiol. 1969;20:204-212. 33. Bastawrous S, Bhargava P, Behnia F, et al. Newer PET application with an old tracer: role of 18F-NaF skeletal PET/CT in oncologic practice. Radiographics. 2014;34:1295-1316. 34. Jadvar H, Desai B, Ji L, et al. Baseline 18F-FDG PET/CT parameters as imaging biomarkers of overall survival in castrate-resistant metastatic prostate cancer. J Nucl Med. 2013;54:1195-1201. 35. Zukotynski KA, Kim CK, Gerbaudo VH, et al. (18)F-FDG-PET/CT and (18)F-NaF-PET/CT in men with castrate-resistant prostate cancer. Am J Nucl Med Mol Imaging. 2015;5:72-82. 36. Evans MJ, Smith-Jones PM, Wongvipat J, et al. Noninvasive measurement of androgen receptor signaling with a positron-emitting radiopharmaceutical that targets prostate-specific membrane antigen. Proc Natl Acad Sci USA. 2011;108:9578-9582. 37. Baum RP, Kulkarni HR, Schuchardt C, et al. 177Lu-labeled prostate-specific membrane antigen radioligand therapy of metastatic castration-resistant prostate cancer: safety and efficacy. J Nucl Med. 2016;57(7):1006-1013.